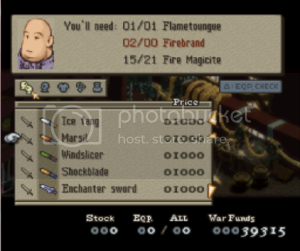 Materials~ well i did that with the current version i replaced Katanas and made them into "magicites" each of a diferent element and a diferent purpose of course with this in mind i changed samurai class into Magiciter that does the exact same thing but using magicites instead and with this in mind i had to remove katanas as usable weapons. my idea for this came when i decided to divide weapons by tier since the game is balance-type patch weapons are divided in 3 tiers and of course theres diference but wanted the real rare ones to be exclusive to synthesis shop . so unless i didnt understand im guessing the new hack will make this posible whitout having to kill/Replace other existing items like i did with katanas? If I do complete it, and if it all works as intended, yes. as for the fort zeakden i never expected it would be posible to randomly open a menu in fort zeakden out of nowhere but then again there are shops i never use... "goug shop" just who buys stuff there? as simple as moving guns to trade cities and bye goug. Fort Zeakden is on this list but I noticed that places like Thieves Fort (which is also the tiny blue dot type of location) is not. Does that mean it isn't possible to add this to a menu for it? Huh, I should probably edit my hack then. Yes it is possible, I just assumed for some reason only the first 16 locations were blue dots. and i think bethla and murond are big blue dots but like the small dots once you are done with them... you are done with them. gah D: ok maybe i was not explicit enough regarding the text bug and i did not make a single change in tactext I SWEAR! but this bug is easy to trigger here some pics with proof. here the usual item description window all fine. but this is what happens if i open item description window if the guy is still telling you the required items. in this situation the game froze. sometimes gets really buggy and caracters go out of the text window it looks all messed up xD. and other times the clerk will stop instantly and his text bubble will dissapear leaving you alone not being able to do a transaction. but if this happens i just go back to the shop menu and its all ok. I just... can't reproduce that bug, but I also don't want to go back to 1.0 to test out. I don't know if anyone can, I just know I fixed a bug that I'm not sure was present in the first version or not. Funky things happen when you change the format of your code. 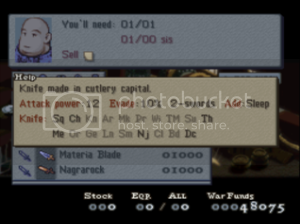 An easy way to tell, if it takes longer to open and navigate the Synthesis menu VS buy/sell (you can notice a pretty obvious pause), then I've already fixed it in the new version. If that's not it, it might have something to do with how you formatted your item descriptions? Enable/Disable Frame skipping whenever you want! Tested on console: Biggest speedups by far coming from text display speed and effect speed (upwards ~300%), walking speed is barely any faster, JP/exp gain display is noticeably faster and AI is just as slow as it's ever been. Use alongside my Cross Skip hack for extra skipness! 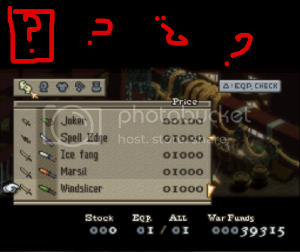 WARNING: Will cause graphical glitches seen in emulator when frame skipping is on. Right now FFTOrgASM has a bug where if you select the last option then select another, it will set that newer option to FFFF. Beware! v1.1: Hopefully fixed loading screens and save screens between battles to force the frame skipping off. You might have seen this before, I figured I'd make a new post given that I updated my last 3 hacks in standalone .xml; The Fur Shop, Bonus Gil, and this one. I'll always recommend to use the spreadsheet because it's so much easier to use, but if you don't want to be bothered because you're not making a story hack, you can just download the .xml. 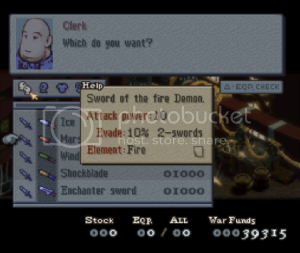 If you want to have guests controllable in battle, just remove the last <Location></Location> section. To make Alma + Ovelia able to join random battles, delete 00000C300000 at the start of line 39. Oooh, awesome. This also obviously brings in the possibility of having AI only units in your roster, which is interesting. How is this different from Razele's Monster Skill is innate? Well, Razele's hack is very buggy and makes the AI walk next to ally units to use their 4th skill. 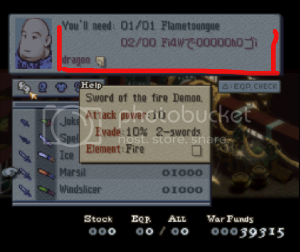 My hack doesn't have that issue, and it displays all monster skills when you check the unit's status. Tired of enemies stealing your precious Move-Find Items? This hack nulls the effect of Move-Find Item for any unit that isn't blue team. So the only units allowed to pick treasures: Blue team units and charmed/invited units by the blue team. Wow, these are great! I always hated them walking onto the traps and stealing my deep dungeon things.